Boston-based Stern McCafferty Architects has overhauled a country home in Massachusetts, transforming the layout to showcase a collection of art work and expand the living areas into a bright annex. The residence was first built in 1905 as a mock-English riding house in Cambridge, Massachusetts – the seat of Harvard University. 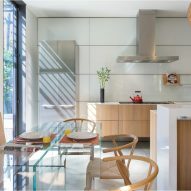 Owned by the president of the Board of Trustees of the Institute of Contemporary Art in Boston, the house was renovated by Stern McCafferty Architects to open onto a room that displays the client's art collection. Works sit across the floor, in the nook beneath a curved staircase, along walls, and on top of furniture. White-matte walls and light wood floors were chosen as a neutral backdrop in presenting the art, similar to the interiors of much larger galleries like the extended San Francisco Museum of Modern Art and New York's MoMA. "The entry into the house was transformed into a gallery," the firm's co-founder David Stern told Dezeen. "We removed portions of the second floor to create a double-height space and introduced areas of simple white walls to accommodate the display of artwork." "The client's collection is modern and minimalist, much like the the interior detailing and much of the furniture," he added. To the right of the entryway, dark-grey walls in the dining room provide a small break from the bright palette and a different backdrop for the work on display. 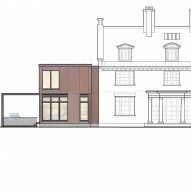 The subdued colour scheme continues into the adjacent, Corten-steel-clad extension, where it balances the large windows brightening the family room and kitchen. 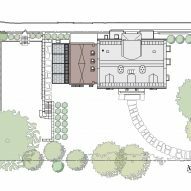 In designing the annex for the Cambridge Residence, the architects sought to create a complimentary form that took cues from specific pieces in the client's collection. "The abstract and modern language of this addition is deferential to the original building, without replicating its style," said Stern. "The use of Corten for the exterior compliments the colour and texture of the original structure." 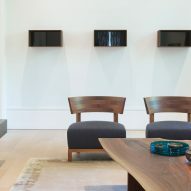 "The use of this material was largely influenced by the owner's collection of Donald Judd boxes made with back painted glass and Cor-ten steel," he added. The steel frame supporting the annex extends beyond the addition's outer walls, covering and defining the limits of an outdoor terrace. A stone-slabbed pathway leads out from the sitting area to a broad lawn at the property's west end. Bedrooms organised around communal spaces occupy the two floors above, where the architects extensively modified the layout to create brighter and more playful spaces for the children. The central passage on the top floor doubles as a playroom. The space has a slightly barreled ceiling, bookcases inserted into walls and white-stained wood siding oriented towards a large window. 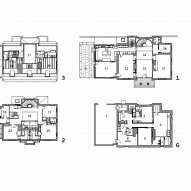 The residence also features a basement volume, where the interior shifts to signal a more practical programme. "The basement has less natural light, while the polished concrete floors and walls, and natural cherry paneling have a more earthy feel; the spaces there – the gym, art room, etc – allowed for a less polished aesthetic," Stern said. 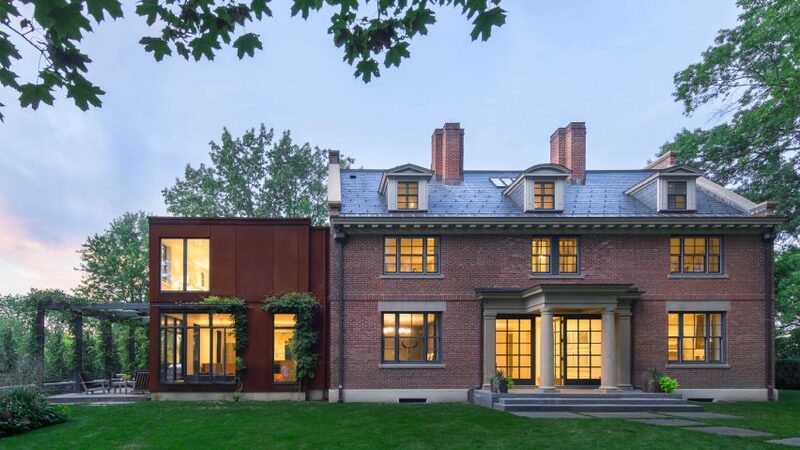 Several other renovation projects have involved adding Corten-steel-panelled extensions to old buildings, including the overhaul a Dutch-colonial homestead in upstate New York and the expansion of an 18th-century Belgian farmhouse. Photography is by Chuck Choi.